23.6 by 16.1 cm., 9 ¼ by 6 ¼ in. 32.5 by 99.7 cm., 12 ¾ by 39 ¼ in. This watercolour shows the city of Exeter from the south from the banks of the river Exe. In the centre is Exeter Cathedral with the houses of Colleton Crescent, built in the 1820s, to the left. J.M.W. Turner painted the city from a similar viewpoint in the mid 1820s (see Smiles and Pidgley, op. cit., no.80, p.106). 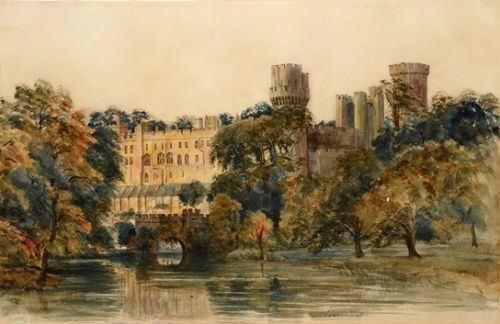 This dates from de Wint’s last major sketching tour, to Exeter and the river Dart in September 1848. In 1848 he was still in poor health following an earlier attack of bronchitis. His wife Harriet recalled in his Memoir: `He was ill the whole of the year 1848, and it was hoped the country would be beneficial. The mild humid air of South Devon, however, did not suit him, although the few days he spent at Exeter he was better and able to sketch a great deal, as he very much admired the city and its venerable cathedral’ (quoted in Hammond Smith, Peter de Wint, 1982, p.125). 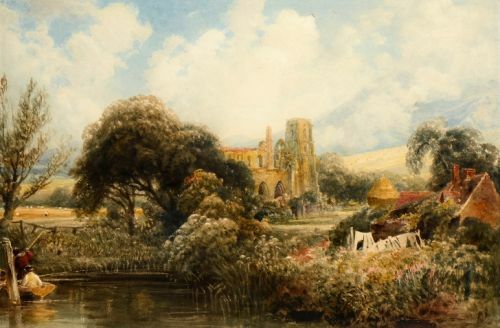 This large studio work was completed in the winter of 1848 and was one of his last exhibited works, at the Old Watercolour Society in 1849 along with `View on the River Dart, Devonshire.’ He died in June 1849. The critic of the Athenaeum magazine thought his exhibits of 1849 were `as remarkable for breadth and mastery of handling as any we have hitherto seen by him.’ The use of white bodycolour is typical of his late work. 36.3 by 55.8 cm., 14 ¼ by 22 in. This is a view of Penrhyn Castle from the south with Beaumaris Castle on Anglesey visible beyond. 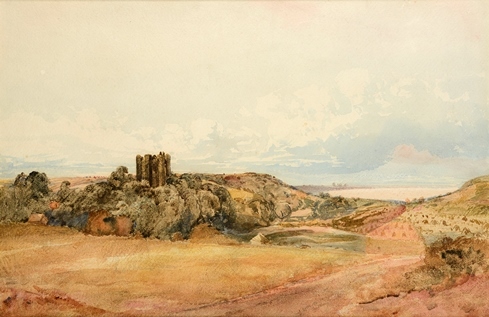 This is likely to be the work exhibited at the Society of Painters in Water-colours in 1832, no.103 as `Penrhyn Castle, with Puffin Island in the Distance' which sold for 20 guineas. Puffin Island sits off the north-east coast of Anglesey. 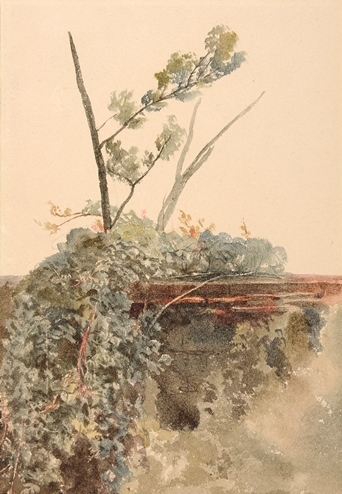 20.5 by 31.1 cm., 8 by 12 ¼ in. De Wint enjoying drawing still-lives and asking his pupils to do likewise. 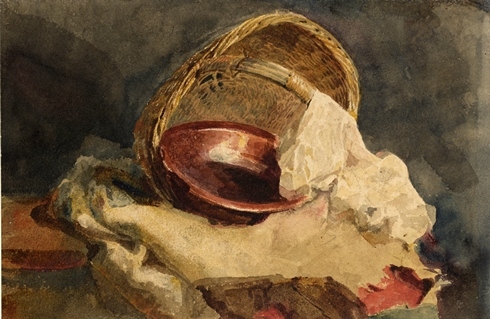 John Moyer Heathcote, one of his best pupils, recalls: `He would take any convenient objects he could find in the room and set them in a group on the table, with a towel or other white cloth carelessly thrown against them. These he required to be carefully imitated’ (from Sir Walter Armstrong’s Memoir of Peter de Wint, 1888, quoted in David Scrase, Drawings and Watercolours by Peter de Wint, 1979, p.15, under no.35). 124 x 203 mm., 4 ¾ x 8 in. This is a typical pen and ink drawing by de Wint. He often drew on scraps of paper or the back of letters or envelopes. The distinctive building in the distance may be Formosa Place, a gothic house built in 1785 by Sir George Young, Bart on the edge of the river on Formosa Island which is next to Cookham Lock. 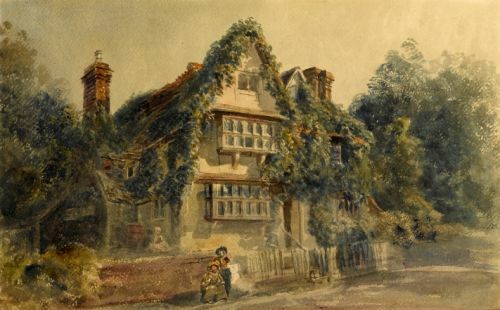 The house was demolished shortly after the Second World War. 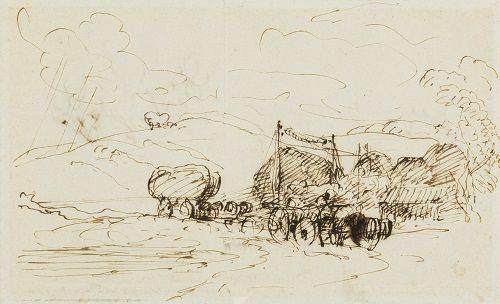 De Wint made thirteen drawings of the Thames for W.B. Cooke?s Thames Scenery between 1814 and 1829 and although this image was not used, it may relate to this series. 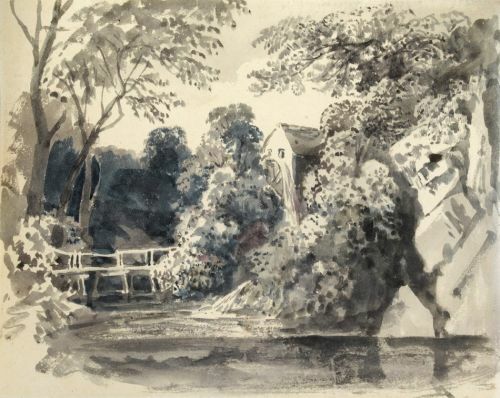 Another view of Cookham by the artist is in the collection of the University of Liverpool (see David Scrace, Drawings and Watercolours by Peter de Wint, 1979, p.19, no.46). 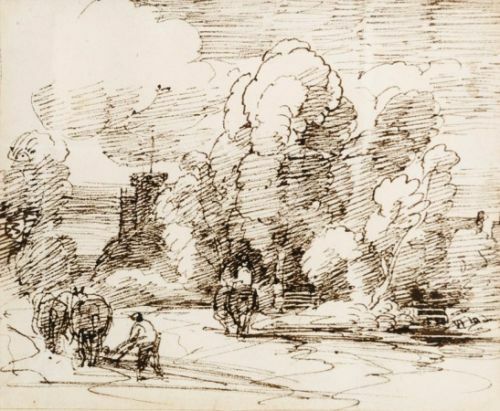 This drawing dates from de Wint?s only trip abroad, to Normandy in 1828. This is the west front of the church. 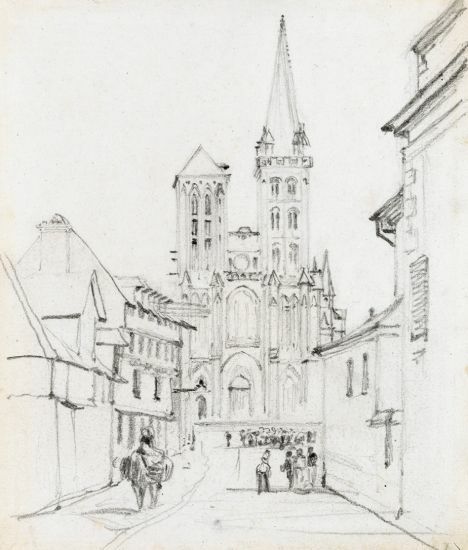 John Sell Cotman visited Lisieux in July 1818 and drew the church from a similar viewpoint. The drawing was engraved for Cotman?s Normandy published in 1822 so it may have been known by de Wint. This is drawn on the back of part of a letter to de Wint which accompanied payment for rent. 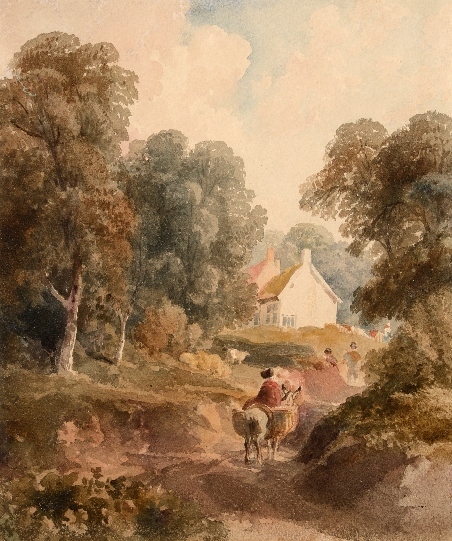 It relates closely to the watercolour of Nottingham in the Victoria and Albert Museum which is dated to 1847/8. This is drawn on the back of part of a letter to de Wint which accompanied payment for rent. This is a view looking south down Derwentwater from Castlerigg with Walla Crag to the left and Maiden Moor. 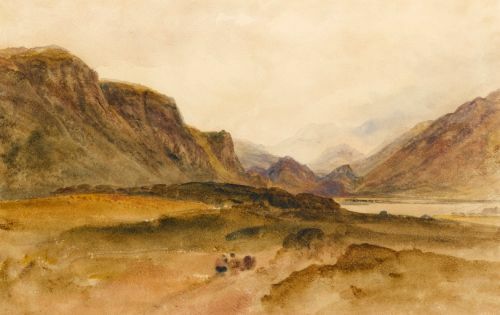 De Wint was a frequent visitor to the Lake District in the 1830s and 1840s. He often stayed with the Howard family at Levens Hall and the Lonsdales at Lowther Castle. 32.4 by 49.6 cm., 12 ¾ by 19 ½ in. Llandaff Cathedral stands on the banks of the river Taff, two miles north-west of the centre of Cardiff. 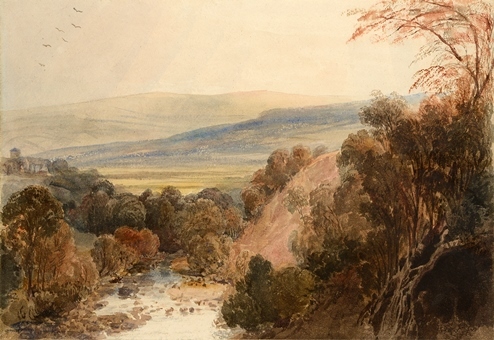 De Wint first visited South Wales and was struck by the beauty of the landscape. He faithfully records the cathedral as it stood at the time but he drawn a tree to disguise the rather incongruous classical temple built by John Wood of Bath in the ruined nave in the 1740s. He has also added mountains behind for dramatic effect. 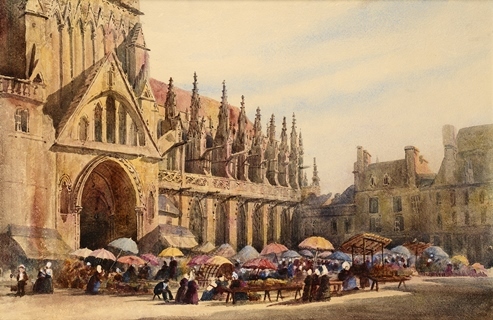 By the time de Wint exhibited the present work in 1848, a rebuilding programme of the cathedral had started under T.H. Wyatt. By 1845, John Prichard had taken over the project and it lasted on and off until 1861 (see John Newman, The Buildings of Wales: Glamorgan, 1995, p.241). As part of the work, the temple was demolished and the cathedral rebuilt in a gothic style. This lasted until 1941 when it was badly damaged in the War and was rebuilt by George Pace between 1949 and 1957. 22.9 by 66.5 cm., 9 by 26 in. The excavation of the Tring Cutting in the 1830s enabled the London to Birmingham railway line to be laid. The cutting was two and half miles in length. This is a view from the east showing Nottingham Castle and St. Mary's Church. It relates closely to a view of Nottingham by de Wint in the Victoria and Albert Museum which is dated to 1847/8. 30.5 by 25.6 cm., 10 ¼ by 12 ¼ in. 25 by 38 cm., 9 ¾ by 15 in. 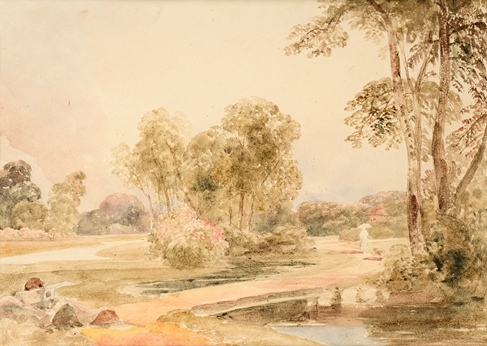 A larger, coloured version of this watercolour was sold at Christie's on 15th November 1983, lot 246. Methley is now part of the city of Leeds, south-east of the centre. 26.7 by 39.2 cm., 10 ½ by 15 ¼ in. Leathley is a small village one mile north east of Otley in North Yorkshire near the border with West Yorkshire. This is a view taken from the north looking down the river Wharfe with the Norman tower of Leathley church visible on the hill to the left. 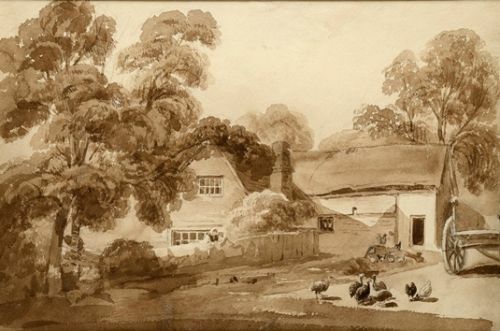 De Wint was a frequent visitor to his patron (and Turner’s) Walter Fawkes (1769-1825) of Farnley Hall, which was only a few miles from Leathley. A nineteenth century biography records a visit: `Bolton Abbey he visited many times….. He first saw it in 1814 when he went to Farnley Hall on a visit to Mr Fawkes’ (Sir Walter Fawkes, Memoir of Peter De Wint, 1888). Stylistically this dates from circa 1820. This dates from de Wint’s only trip abroad, to Normandy in 1828. The church of St Jacques stands on the Place Saint-Jacques, one of the main squares in Normandy town. This view is of the north-east of the church looking south from the Place Saint-Jacques with the transept on the left. The church was built in around 1283 but the building was not finished until the late sixteenth century. Other Normandy views include `Dieppe Castle from the Beach’ in the Usher Art Gallery, Lincoln and views of Dieppe and Rouen were included in the sale of works by de Wint from the Mathew Pryor collection sold at Sotheby’s on 4th July 2002, lots 392-4). 245 x 341 mm., 9 ½ x 13 ¼ in.